What is the OSMcast? – OSMcast! OSM: Things that are so awesome that only a three letters can contain it! Or just say “awesome” really fast. I think you’ll get the idea. Podcast: “A series of digital-media files which are distributed over the Internet using syndication feeds for playback on portable media players and computers. The term podcast, like broadcast, can refer either to the series of content itself or to the method by which it is syndicated; the latter is also called podcasting. The host or author of a podcast is often called a podcaster.” Thanks Wikipedia! 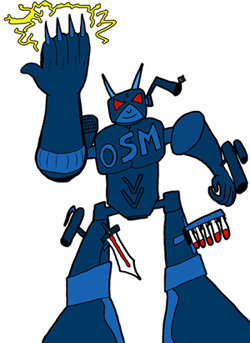 In other words, the OSMcast is a podcast about things that are awesome. Because we figure, hey everyone likes awesome things, right? Also “AWESOMEcast” is way too long to type all the time. And 15 million podcasts to date have started up using that name and then gave up after 3 episodes. But after 10+ years of podcasting… I guess we should have gotten the longer version after all? Ah well! We talk about all sorts of things. Anime, video games, movies, whatever we are into We also have a super sweet selection of interviews we have done throughout the years. While we never really thought of being an interview-based show, we do not things growing and changing!. What makes up the OSMcast? Moment of OSM: This is the “What have you been playing/watching/consuming?” portion of the podcast. Each of us pick something awesome that we have been doing for the week. It could be an anime series, video game, or even a crazy new flavor of tea that has caught our taste buds. YOU NEVER KNOW! World of OSM*: AKA the News. Basil will browse the various news sites and bring to you the sorta kinda almost latest news from the anime/video gaming/geek world. We try to keep the anime news in anime, and video games in video games… But no promises. The two OSM segments usually last for the first thirty minutes. Usually. The Actual Segment: What you probably actually come to listen to. Ostensibly this is whatever is in the title of the actual show. This also tends to last thirty minutes. Of course, for all episodes mileage may vary as we have been known to babble on a subject forever, but then next time get what we wanted to say done in twenty. *Due to in 2010 moving to an every-other-week schedule, World of OSM kinda lost it’s punch as the new ended up being even less topical and current than usual. But the Moments of OSM tend to be longer now, to balance everything out.